But the most decisive play of Brady’s night was a strip sack he took during what could’ve been the game-deciding drive, and the moment produced two beautiful photos to sum but his game. The Eagles win came despite a dominant performance from Tom Brady, who played one of the greatest games in Super Bowl history. 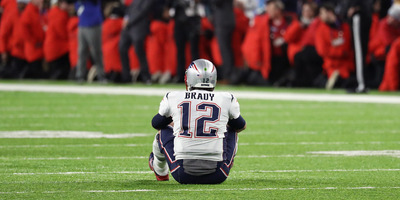 Brady finished the game with 505 yards, three touchdowns, and no interceptions, becoming the first quarterback in NFL history to have such a night in a loss – regular season or playoffs. But despite a dominant performance passing, the most important play of Brady’s night was his biggest gaffe. After the Eagles scored their go-ahead touchdown, Brady and the Patriots offence got the ball back down five with just over two minutes left. 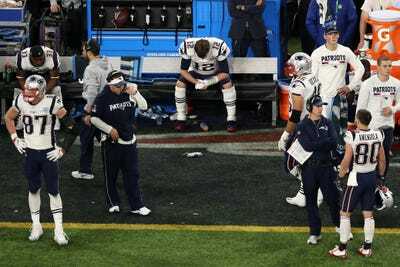 The script looked set for the Patriots to pull off yet another unbelievable Super Bowl comeback.